wine No wine is allowed into our selection until it has been tried by Pomona staff and at least two others whose opinion we trust and value. We don't pretend to like all of our wines but appreciate why others might do. We are always willing to guide you in your selection, be it dependent on price, style or personal taste. 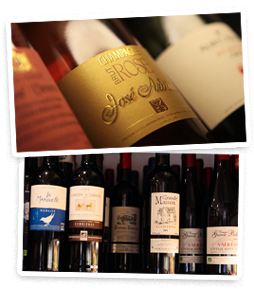 In our wine selection you'll find up to 80 wines equally split between reds, whites and a few rosés. The reds and whites are split into 3 sections. French, Rest of Europe and New World. Many are award-winning, some not so well known but interesting never the less. We keep loyal to the favourites, but once a month change a few just to keep the selection fresh. We often open a bottle or two for tasting...keep an eye on our website for more information. A real favourite is our prosecco which is produced in the Venetto, using the traditional age old vinification method, and is as good as, if not better than many champagnes at twice the price. This continues, year after year to be our best selling fizz with customers returning time and time again. An award winning, traditionally produced, 'London Gin'. It knocks spots off of some of the better known brands. Our 'UK5' 'Vodka, unlike others, once re-distilled, needs no charcoal filtering nor added glycerol to achieve perfection. A truly smooth Vodka. White and Golden Rum from Paraguay - Mojitos anyone!? Whisky; Bruichladdich, a single malt classic from, Queen of the Hebrides, Islay. This distillery, one of eight on the island was founded in 1881 and still produces whiskies of outstanding quality. As with our wines, in this section we keep hold of ever present favourites but once a month bring in some new products based on personal preference, customer recommendations and what's new & exciting. Thus you will always find Freedom "handcrafted English lager", St. Peters Organic Ale and Dunkerton's Black Fox,, a superbly bright, bold and rather special dry cider. We have bottled Camden Beers from our local Camden Town Brewery: Hells Lager, Gentleman's Wit and Pale Ale. Again, as with our wines, we hold regular tastings, see our website and sign up to our newsletter for regular updates.